Happy Monday Everyone! 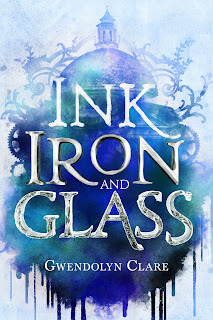 Today I’m excited to have debut author Gwendolyn Clare here to share about her YA fantasy INK, IRON, AND GLASS. It sounds like a fantastic story with diverse characters, a page-turning plot, and an amazing world. I can't wait to read it. Before I get to my interview, I've got two things to share. WriteOnCon is back! It's an online conference, and this year's conference is Friday, Feb. 9th through Sunday, Feb 11th. It looks really good and has a lot of good agents and writers. I think I'm going to go. The new organizers do charge a fee, but the maximum is $15. LoveAtFirstChapter is a new online service launching on Feb. 14th by some YA authors who are friends. You can sign up to receive free first chapters of YA books and if you are an author, submit your book to them. If they like it, they may offer your first chapter too. Now back to my interview with Gwendolyn! Hi Gwendolyn! Thanks so much for joining us. In college I was very focused on becoming a scientist. I double-majored in biology and geology, and in winter I practically never saw the sun because of all the labs. But then I took a year off before grad school and had some time to breathe, and that's when I started writing seriously with the aim of publication. 2. That's awesome that you were able to take a break and write like you wanted. Where did you get the idea for your story? I'm a big fan of the Myst video game series, and I wanted to write a story about an artificial world that explicitly addressed the parallels to colonialism. This idea began as a short story about Elsa's mother, but as I was writing it I realized that the implications for the next generation were fertile ground for a novel. So Elsa became the protagonist, and that entire story became backstory. 3. What a fun way to come up with a story idea. I love your world building. The scriptology, magic ink, and steampunk sound really unique. What was your world building process like? magic is indistinguishable from science. My world-building process leaned on this principle -- scriptology is effectively portal magic that has been analyzed and harnessed into a scientific discipline. That's my speculative element, from which the rest can be extrapolated. So how would Italian history change if scientists had access to magical abilities? Probably the biggest world-building challenge was figuring out how to not send all of European history completely off the rails. For that I needed a secret society of scientists whose primary goal is to keep their amazing skills away from the political field -- a goal which may not always align with Elsa's mission to rescue her mother. 4. Wow! You're making me wish that I had a science background like you. In INK, IRON, AND GLASS, scriptology is a branch of science. Did you draw on your scientific background in creating your story? If so, how? My love of science definitely influenced the decision to write a novel that centers a bunch of mad scientists as main characters, instead of casting the scientists only as villains. But real-life science is often slow, meticulous, tedious work that wouldn't make for very compelling reading, so it was actually a challenge to strike the right balance between realism and reader expectation. I hope the story communicates the excitement of science without getting too bogged down in the frustration of it. I did draw on computer science as a direct influence when figuring out how scriptology should work. While I couldn't make that connection explicit in the book -- there aren't any computers! -- scriptology functions a lot like an object-oriented programming language, where ink is the code and the universe itself executes the program. 5. Your story has been described as a real page turner with a fantastic plot and plot twists. Are you a punster or plotter and how did that work for you when writing this story? Share some of your plot secrets with the rest of us. I used to think I was a plotter, until I met serious plotters and realized they actually wrote down their outlines. (Weirdos.) So I'm somewhere in the middle of the spectrum -- I like to know where the story begins, where it ends, and a few of the major set-pieces I need to hit along the way before I begin drafting. More of a plot skeleton than an exact road map. While I still mostly identify as a plotter, I also believe that no outline survives contact with the first draft, nor should it. The best plot twists arise organically from decisions the characters make. Surprising the reader with plot twists isn't the most important part; the most important part is that the twists feel consistent and believable in retrospect. To set that up you need a deep understanding of your characters, which you may not have yet at the outlining stage. So I do like to leave room for the characters to run off in an unexpected direction, and not cling too tightly to the original outline. 6. I'm more of a plotter like you, so your advice is really helpful. Tell us a bit about Elsa as a character. Was there anything that surprised you about her? lsa's a socially maladjusted introvert who's too smart for her own good -- which makes her probably the most similar to teenage-Gwen of all the characters I've written. But she does still manage to surprise me, because her homeworld is so different from Europe and she's observing everything with an outsider's perspective. I set the novel in Italy partly because I'm half Italian, and there's something particularly delightful about Elsa's mental commentary on a culture I identify with. 7. You’ve also written a lot of short fiction, poetry, and flash fiction. Did any of that help you with writing your novel? When I was teaching myself how to write for publication, I exclusively worked on short stories for the first couple years. Short fiction is a great training ground for developing your craft toolkit. While not all of the techniques transfer over to novels, short stories have the advantage that you can practice the whole process -- drafting a beginning, middle, and end; revising; even submitting and dealing with rejections -- all with a relatively low investment. So my time focusing on short fiction absolutely prepared me both to write the novel, and also to survive the (occasionally soul-crushing) submission process. 8. Your agent is Jennifer Azantian. Share how she became your agent and your road to publication. That's not to say it wasn't a struggle. INK, IRON, AND GLASS was the fourth novel I completed and queried. Partly it was a matter of improving my craft with each project, and partly it was a matter of getting the right material in front of the right agent at the right time. I also did an epic quantity of research on how to write query letters and on the agents themselves, so I could aim my queries in the right direction. Even after you sign with an agent, the need to keep yourself informed about the business side of the industry never goes away, so best get used to it now! 9. That's great to know that querying works! I saw on your website that you went to the Baltimore Book Fest and the SWFA Nebula conference this year. How did you arrange those events? How else are you spreading the word about your book? Some YA book festivals are pretty exclusive and your publicist has to wrangle you a spot, but with science fiction and fantasy conventions, it's often just a matter of volunteering to participate as a panelist. I don't know that I'd recommend festivals and conventions as the best return on investment -- the travel expenses add up quick -- but if you enjoy going to cons, then the promotional and networking opportunities are nice side-effects. I am also promoting in the usual ways -- a blog tour, a local release party, etc -- but the truth is that writers don't sell books, at least not directly. Readers are the ones who determine which books become successful. So my philosophy is to focus on having genuine interactions (online or in meat-space) with other people who are passionate about the genre, and hopefully some of them will fall in love with my book and advocate for it. I've just finished a draft of the sequel to INK, IRON, AND GLASS, so while I'm waiting on editorial comments, I'm giving the creative coffers time to refill. 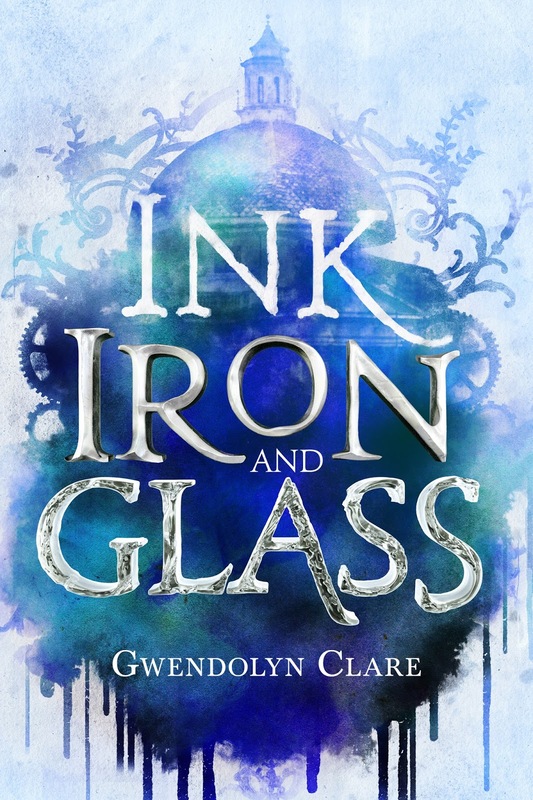 Gwendolyn has generously offered an ARC of INK, IRON, AND GLASS for a giveaway. To enter, all you need to do is be a follower (just click the follow button if you’re not a follower) and leave a comment through February 10th. If your e-mail is not on your Google Profile, you must leave it in the comments to enter the contest. Monday, February 19th I will be off for President's Day! 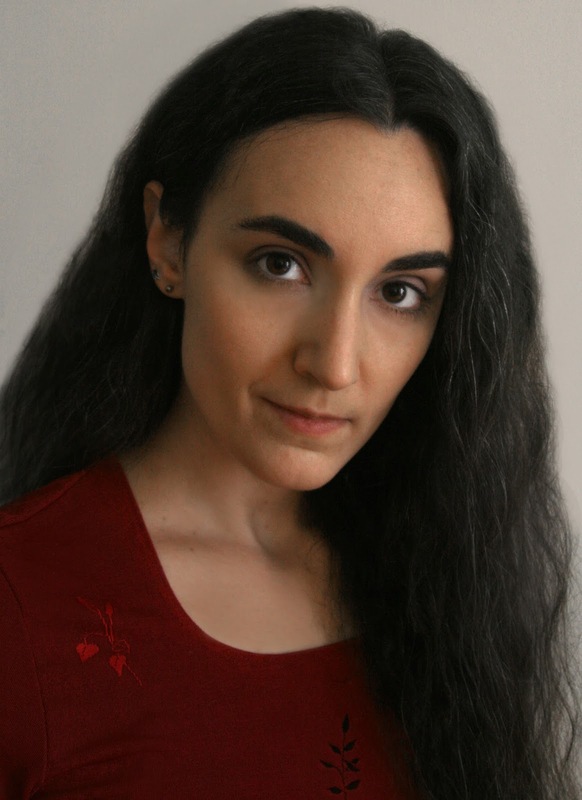 Monday, February 26th I have a guest post by debut author Kaitlin Sage Patterson and her agent Brent Taylor with a giveaway of her YA fantasy THE DIMINISHED and a query critique giveaway by Brent. Great interview! This looks like an interesting book. I wish I could outline in my head...my memory isn't that good! I love the science aspect in this one. Her story to get this one to the shelf is a good one for aspiring writers: Don't give up! I won't need to be in the drawing as I have a stack of MG books a mile high to get through. What a unique concept--this one sounds so great! The cover is beautiful. Best of luck, Gwendolyn. And The LoveAtFirstChapter is a fantastic idea. Congratulations to Gwendolyn! The book sounds fantastic. Myst is a great series. Hey, I'm one of those weirdos! Inspired by a computer game. That is too cool. Ink, Iron and Glass sounds wonderful, love the concept of science blended with the Italian influences. Lovely interview. Congratulations on its upcoming release. I also tweeted about it. What an interesting concept. I need to keep up on my new releases. There are so many good ones coming out. Congrats on the release, Gwen! Congratulations to Gwendolyn. I love the idea of Scriptology having the power to create new worlds. (Really, isn't that what fiction writers do in general? But Scriptology sounds . . . elegant.) I'm also intrigued by a Steampunk Italy. Usually I associate Steampunk with England. I liked her approach to novel-writing, working on short stories and flash fiction first to hone her craft. I would definitely be interested in this book. I'm mentioning this contest on Twitter and my FB author page as well. I can imagine how busy having a double science major kept you! I tried doing that with music and biology. Didn't work so well. Music won. So, you think plotters who outline are weirdos? That would be me. LOL! That's wonderful to hear WriteOnCon is back. You really have to research your cons and festivals. Some are not good fits for book sales. Authors with a background in science always seem to have the most interesting books. Thank you for introducing this author to us, Natalie. History, science, secret societies, AND magic. I'm in!!! Wishing you all the best, Gwendolyn! The book sounds intriguing. It was great to learn more about you. Natalie, thanks for another great interview. I'll pass on the giveaway this time. Enjoy your week! Congrats to Gwendolyn! This sounds really different and intriguing, especially the mix of science and magic. A science background sure elevates many a story. Finding the right mixture has to be a challenge sometimes indeed. This books sounds like an amazing read! I love science and magic! Wow, I love how so many influences came together for this story and how you persevered and continued to grow your craft. Congrats on all of your hard work, Gwendolyn! I really enjoy books with real science in them even when it's mixed up with the fantastical. Congrats to Gwendolyn. It sounds an interesting concept. Thanks for this great interview. Great interview! And she actually got her agent through the slush pile! Persistence is key. Congrats Gwendolyn and thanks for sharing your thoughts. I love interviews. Nice interview. Thanks for sharing. I follow. Interesting interview. Enjoyed meeting you, Gwendolyn. Intriguing! Thank you for the interview! The book sounds fantastic and the cover looks amazing! This book goes directly on my TBR list. Thanks for the chance to win! Go Gwendolyn! Love that cover - it's awesome! Wishing her much success! Oh, fun! This sounds like a great book! Way to go! The story line sounds interesting and intriguing! This book sounds terrific! I'd love to read it. Following you on Instagram. Thank you for the chance to win. I would love to read this. I enjoyed the interview with the author. It sounds like a great read. Thanks. Sounds like a good book. Thanks for hosting this giveaway.